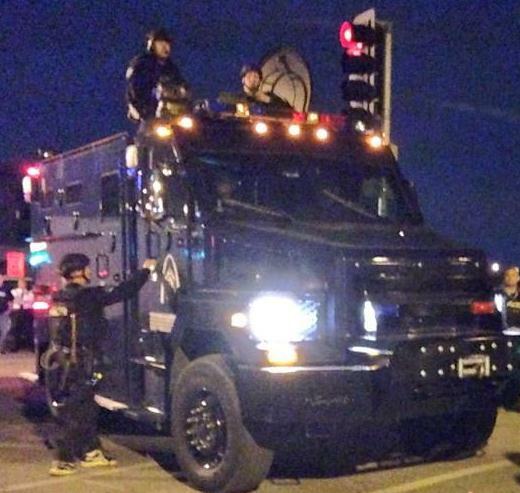 Warrior cops on streets of St. Louis this week. DETROIT – As “warrior cops” armed with assault weapons and tanks rode through the streets of St. Louis this week to stem protests against police killings of three young Black men, here in Detroit, a mistrial was declared Oct. 10 in the case of another “warrior cop,” Joseph Weekley, Jr., for the second time. 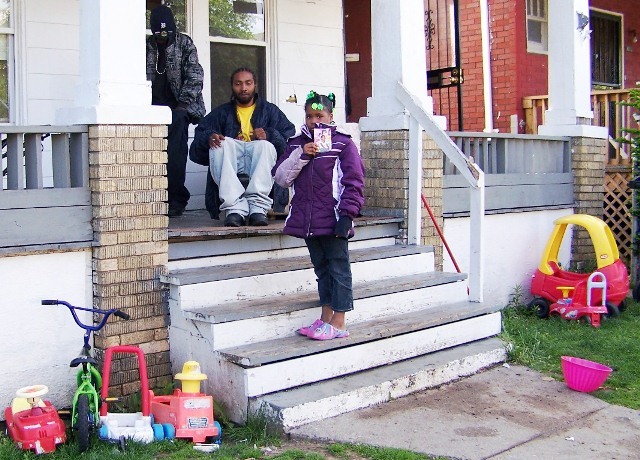 Weekley shot seven-year-old Aiyana Stanley-Jones to death May 16, 2010, shortly after midnight, during a military assault on a home on the city’s impoverished east side, as cameras from A&E’s “First 48” TV program rolled. Four young children, with their parents, grandmother, great-aunt, uncles and cousins, were asleep there when an incendiary grenade shattered the flat’s front window. Within seconds, Weekley stormed in and shot Aiyana through the top of her head with his MP5 submachine gun. From that moment in occupied Detroit, the fix was in. 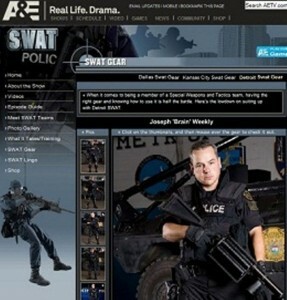 Joseph Weekley shown as star on A&E’s Detroit SWAT website. 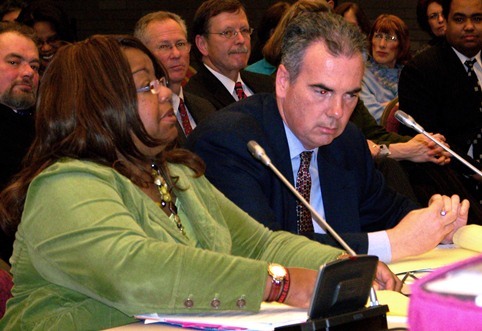 She spoke at a press conference held by family attorney Geoffrey Fieger May 19, 2010, after this reporter questioned her to counter the first question asked by a mainstream reporter, “Didn’t Charles give Chauncey the gun?” in the killing of JeRean Blake, 17, on May 14, 2010. 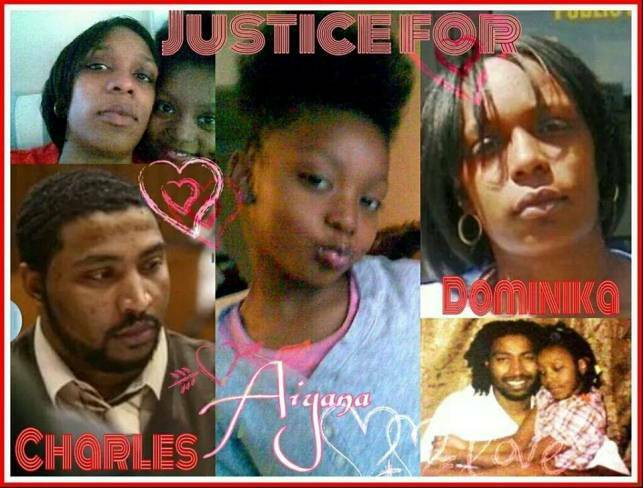 Aiyana’s father Charles Jones was not charged in the Blake case until 17 months later. An inside source has said that a Michigan State Trooper investigation of Aiyana’s death was primarily aimed at setting her father up to justify the invasion of her home. The source said shell casings found in the backyard, produced as evidence in the trial of weaponry in the home, were dug up and looked as though they had been there for years. No weapons or ammunition were found during the raid. The only person named in a warrant for the raid was Chauncey Owens, who lived in the upper flat with Aiyana’s aunt. From that point on, most of the mainstream media has acted as virtual press spokespersons for the Detroit Police Department, taking advantage of deliberate police leaks. In recent months after the Jones-Owens’ convictions, many reported that police had a warrant for Jones before the raid, an utter falsehood never testified to in any trial. They have also repeatedly reported that Owens was “hiding” in the upper flat, when in fact that was where he had lived for a lengthy time. Warren Evans in trailer for A&E series “The Chief.” He was fired shortly after his plans for this series became known. He is now running for Wayne County Executive. Then Detroit police chief Warren Evans sanctioned the embedding of “The First 48” crew with raid teams and authorized “no-knock” raids without first asking the person sought to step outside, which Owens did on his own the night of April 16. Police reported in Weekley’s first trial that they had surveilled the home all day before the raid, and saw Owens emerge several times. Despite their denials, four minutes (the time it took VOD to walk the distance reported at the trial) was clearly long enough for them to speed around the corner and arrest him without incident. 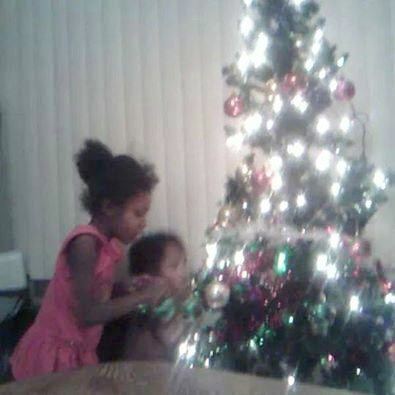 This photo was taken hours after Weekley shot Aiyana to death, by VOD. Toys seen here are the same toys portrayed on slides during Weekley’s trials. Weekley’s testimony that Mertilla Jones grabbed his gun, contradicted by forensic and eyewitness testimony, as well as the testimony of officers who said they saw no toys, should constitute perjury. Team leader Sgt. Tim Dollinger said they would have carried out the raid regardless but might not have used the stun grenade if children under “18 months” were in the home, towards the end of the prosecution’s case, an utterly arbitrary selection of age. In addition to Aiyana, her three baby brothers were also in the home, including Dominika and Charles Jones’ two-month-old newborn baby. In Georgia this year, a 19-month old baby was severely burned when a stun grenade landed in his crib. Weekley was released on personal bond and has been free since, while Jones and Owens were remanded without bond, and have not seen the light of day for years. 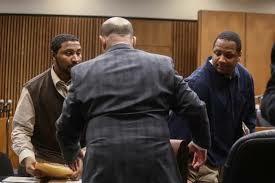 Charles Jones (l) and Chauncey Owens (r) during trial; Jones’ attorney Leon Weiss with back to camera. In police videotapes of Owens’ interrogation after the raid, shown during the Owens-Jones trial in April of this year, Owens only confessed to the killing after police allowed him to talk to his fiancée, who told him, “’Yana’s dead.” Owens repeatedly insisted that Jones did NOT give him the gun, naming another man. In April, 2014, two separate juries found Owens guilty of first-degree murder despite lingering questions about the involvement of his brother Sh’rron Hurt. The second found Jones guilty of second-degree murder for “aiding and abetting,” although they exonerated him of the gun charges which were the only reason for his murder charges. Owens was sentenced to life without parole. Jones, who had crawled through his daughter’s blood and brains on police orders the night of her killing, was sentenced to 40-60 years plus 10-20 years for perjury. He tried to put a brave face on at his sentencing, but broke down in tears, overwhelmed by grief for his daughter and his separation from his family, including six sons. Both sentences are on appeal. Wayne County Prosecutor Kym Worthy with Asst. Pros. Robert Moran at her left, testifying at state legislative hearing. Mostly appallingly, Wayne County Prosecutor Kym Worthy allowed Assistant Prosecutor Robert Moran to try both Aiyana’s father Charles and Chauncey Owens, while at the same time pursuing the case against Weekley. Moran’s demeanor during Weekley’s trials was not protective of Aiyana’s relatives, for whom he should have been advocating. He never once jumped up to object to defense attorney Steve Fishman’s continued characterization of Mertilla Jones’ emotional, weeping testimony as a “diatribe,” and his continual demeaning of Ms. Jones on the witness stand, during the second trial. Fishman repeatedly mocked her statement that “the police came to kill,” that Weekley put his gun to Aiyana’s head. None of the rest of the media aside from VOD reported Medical Examiner Carl Schmidt’s testimony that a contact gunshot wound to the head would NOT cause stippling, the lack of which Fishman cited as evidence that there was no close-range firing. SRT police officer Shawn Stallard said he saw no struggle with Weekley. Moran never objected to Fishman’s irrelevant statements about Ms. Jones’ sons being in prison. During the first trial, he objected to the use of Facebook photos, taken at unknown times and places by unknown individuals, allegedly showing male family members with guns, but not in the presence of the jury, who freely saw and handled the bogus evidence. 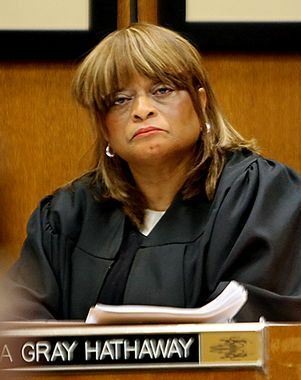 Wayne County Circuit Court Judge Cynthia Gray Hathaway’s stance in both of Weekley’s trials has clearly been biased toward him. She instituted a thorough screening of the jury venire of hundreds, having them fill out questionnaires asking whether they would be influenced by events in Ferguson, MO or by books and articles such as “The Rise of the Warrior Cop” on the militarization of the police. Only those who were not tossed out based on their questionnaires were verbally examined in court. Astounding even mainstream media, Hathaway granted a “directed verdict” dismissing the involuntary manslaughter charges against Weekley, leaving the jury to ponder only the high misdeameanor of “reckless use of a firearm resulting in death.” The prosecution’s appeal of that verdict was denied by an appeals court headed by Judge Michael Talbot, known for his racist treatment of those who come before him. In 1986, as a Detroit Recorders’ Court Judge, he caused gasps when he sentenced Damion Todd, 17, to mandatory life in prison without parole at hard labor and in solitary confinement, for murder, a sentence that does not even exist in Michigan jurisprudence. He added another term of 100 to 200 years for assault with intent to commit murder. 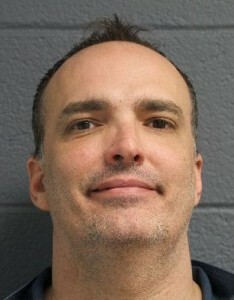 He likewise has ruled that the 2012 U.S. Supreme Court decision outlawing juvenile life without parole is not retroactive, a ruling being appealed by a consortium of attorneys on behalf of Michigan’s juvenile lifers. He was on the appeals panel that summarily overturned Wayne County Circuit Court Judge Richard Skutt’s ruling barring “jail-house snitch” Jay Schlenkerman from testifying against Charles Jones, the father of Aiyana Stanley-Jones. Jail-house snitch Jay Schlenkerman testified against Aiyana’s dad. He is shown here in his current MDOC residence. Months ago, VOD was contacted by an inside source with friends in the Prosecutor’s office who foretold the dismissal of the manslaughter charge, and that Weekley would walk with no jail time. He said many were upset about Moran’s handling of the case, which was confirmed later by Moran’s statement to family members that many in the office were no longer speaking to him. Where does the blame lie in this debacle? Clearly, the police state and prison nation that this country has become, the judge, the prosecutor and the defense attorney conspired to get Weekley off. Prosecutor Kym Worthy conspired to blame Charles Jones for the death of his daughter. But what has happened to the people of Detroit? Many conducted an angry candlelight vigil outside Aiyana’s home after her death. But then media personalities like the late Angelo Henderson and Mildred Gaddis of 1200 AM began muddying the waters, using repeated interviews with Lyvonne Cargill, the mother of JeRean Blake, to criminalize the entire Jones family. Despite Henderson’s pro-police stance, including his daily reporting of crimes among poor people while ignoring the crime of the rich, he was hailed by many prominent Detroiters as a hero at his funeral. 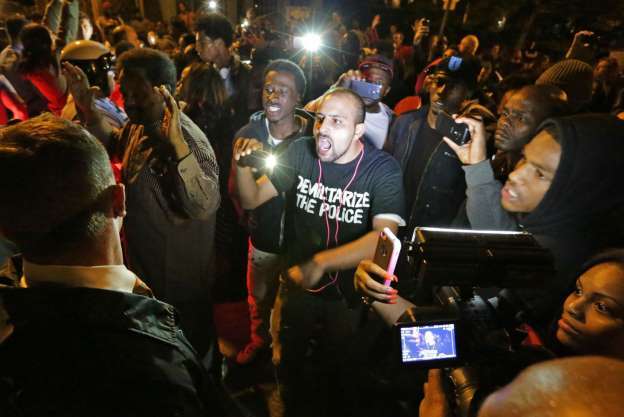 Youth protest St. Louis police killing of Vonderrit Myers, 18. In the wake of their commentary, and other biased mainstream media reporting, the people of Detroit went to sleep, unlike the people of St. Louis and Ferguson, MO, in particular the youth, who have risen up after the virtual executions of three young Black men by white police officers there. Meanwhile, during our sleep, not only Aiyana Jones’ life, but the entire City of Detroit, including our Water Department and Belle Isle, has been stolen from under our feet with virtually no effective resistance or outcry. 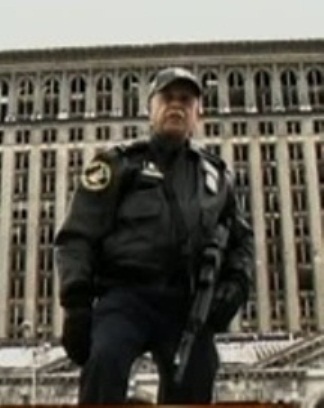 “Warrior cops” and the police state are meant to suppress any resistance to the blatant robbery of everything owned by Black and poor people in the U.S., beginning first with the largest Black-majority city in the country, Detroit. WHEN WILL DETROIT RISE UP? THIS ARTICLE IS ***RIGHT ON THE MONEY*** WHEN IT COMES TO THE BEHAVIOUR OF ***THE NEW MILITIA*** THAT USED TO REPRESENT “THE PEOPLE” BUT WHO NOW REPRESENT “THE CORPORATIONS*!!! THIS IS THE DAWN OF A NEW AGE AND ***EVERYDAY PEOPLE*** ARE NOT INCLUDED IN IT!! !